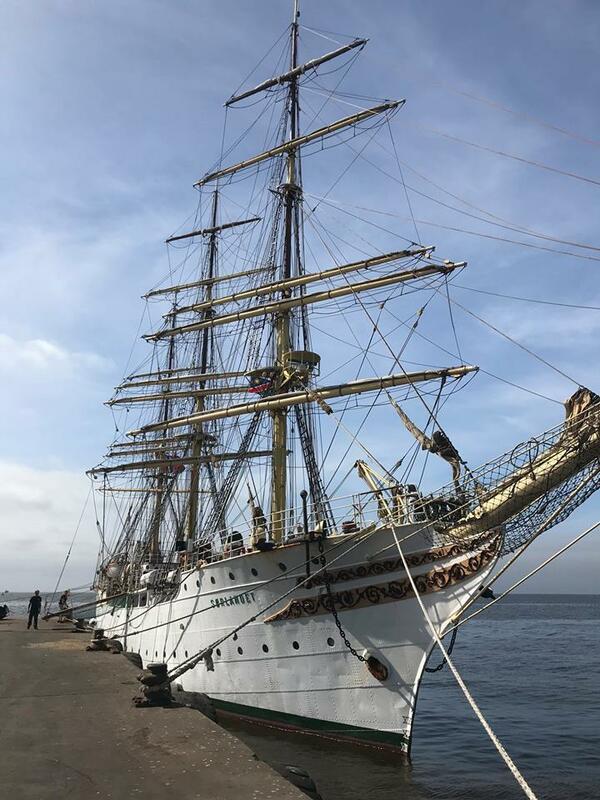 Pictured: The Sørlandet docked at Walvis Bay.Photographs: Courtesy of Souleman Louragli. 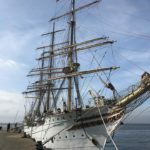 The oldest full square rigged tall ship in operation in the world arrived in the Walvis Bay harbour a few days ago to undergo some repairs and to fill up on provision before sailing for the island of Saint Helena. The Sørlandet is one of the very few full square rigged ships left in the world and was built in Kristiansand, Norway, in 1927 as a full square rigged tall ship for the exclusive purpose of training young people from all over the world for the merchant marine industry. Students who enroll for training experience the true feeling of sailing an authentic tall ship. Although the old ship has been fitted with engines its primary source of propulsion is the wind and she is still operated the way it was done before the advent of steam and diesel power. When under sail students and permanent crew must work as a team and together they use the wind to move 850 tons of steel through the water. The training of young merchant marine prospects is founded in the principle of sailing the ship to her next destination as fast and as safely as possible. One crew member who came ashore in Walvis Bay over the weekend, Souleman Louragli, said that every person on board gets a job to do and is responsible for all his or her crew mates during the time they spend on board for training. The old lady of the seas is owned and administrated by a non-profit foundation in Norway. Souleman said the objective of the ship’s sailing activities is to offer students an experience in traditional life on board a tall ship, as well as maintaining the ship by active use. People of all ages between 15 and 70 of both sexes and of all nationalities are welcomed to participate as trainees. During a cruise students learn skills, such as being a helmsman, a lookout, safety and participating in active sail manoeuvres. She has a capacity for 70 trainees and has between 15 and 18 permanent crew members. When chartered the Sørlandet can accommodate up to 150 passengers and when alongside it can host 200 guests. Being square rigged ship means that the sails and rigging arrangement are carried on horizontal spars which are perpendicular, or square, to the keel of the vessel and to the masts. Souleman said before the Sørlandet came to Walvis Bay she docked in Cape Town for a few days. While in Walvis Bay she docked at one of the jetty’s in the Synchrolift area of the port and is ready to sail to the Island of Saint Helena on Sunday. According to Souleman from Saint Helena the ship will sail to Brazil and from there it will visit certain islands in the Caribbean and the USA. The Sørlandet displaces 891 tons and is 64.15 metres long and 8.87 metres wide at the beam. The mast head is 35 metres tall and the ship has two decks. When under full sail the ship has 27 sail sheets with an area of 1 240 square metres to propel it forward.